For any small business, this is actually a good question (insert designers reading this making a choking sound). 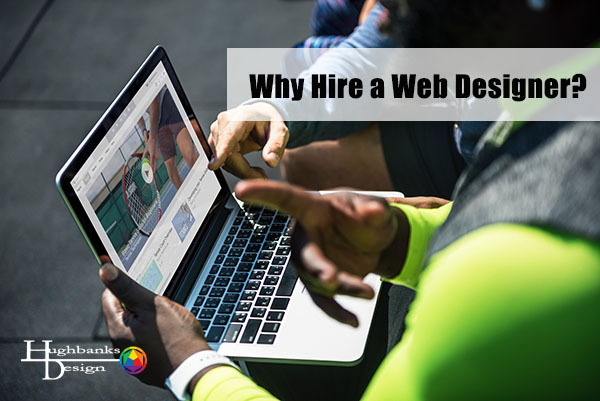 With sites like Wix, Square Space, and WordPress, it is very tempting to go it alone, forgoing what seems like a high bill from a web designer. So why not just create the website yourself and save yourself the trouble? Before you go down that rabbit hole, ask yourself this, why am I making a website in the first place? You need leads and sales right? Now ask yourself another question, do I know the optimal way to have my website do just that? For example, if you’re a dentist, do you know why corporate and health sites have a lot of blues? Sites like Wix, Square Space and WordPress gives you the tools for a website. It’s like getting handed a toolbox to build a house. You might know how to hammer in a nail, but a carpenter can get it done faster, using the best practices for the job and make your house look stunning! These DYI sites are the same. They give you the tools, but a web designer is going to know how to put different elements in optimal places to direct your website to your target audience. Also a quick note about Search Engine Optimization. Gone are the days where you can have a poorly designed site, stuff it with keywords and get your business found by Google. One of the rankings signals Google uses is user experience. How easy is it for a user to go from point ‘a’ to point ‘b’ on the website? If a viewer is looking for something on the website, how easy is it to find and understand? These are things a professional web designer will know and perform for you. Now, all that being said, if your business is so strapped for cash and capital that your budget is $200 for a website, that might be a time where I would say doing a DIY website and spend the $200 getting clients using something like Adwords might be better. $200 budget is not going to get you the best website for your business. I would suggest creating a website to the best of your abilities, then when budget is more open to it, bring in a web designer or consultant to see what improvements could be made to your current design, or look at the possibility of redesigning your site completely in order to convert your viewers into leads and sales. Ultimately a web design professional is a good investment for your business. You can be handed the tools, the tips, the tricks, but budget willing, it’s best to hand that off to someone whom it’s their business to make that website and make it work hard for you so you can take your time and energy and focus on your service or product you offer. It is a well-known fact that a key to growing your business is delegating. If you’re looking to grow your business in 2018, it might be in our best interest to delegate your website to someone who will make it the hard-working marketing machine it is meant to be.